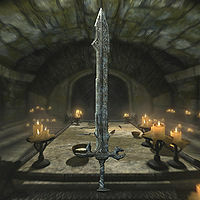 Eduj is a Nord Hero Sword that served as one of favored weapons of the Nord warrior Kvenel the Tongue, alongside the Nord Hero War Axe Okin. Eduj can be found in the possession of its owner within his tomb, Volunruud. The weapon itself comes with an enchantment that does ten points of frost damage and slows the target by fifty points for three seconds. Tempering Eduj requires a steel ingot and the Arcane Blacksmith perk, with the benefits of the improvements being doubled if the steel smithing perk is unlocked. Heddic Volunnar, a Nord who went on an expedition to explore Kvenel's tomb, made a mention of his weapons in his notes on Volunruud before tragically being killed. As the notes reveal, the door to Kvenel's resting place is locked in place, waiting for ceremonial replicas of his signature weapons to open it. Once inside the inner section of the crypt, Volunruud Elder's Cairn, an apparition of Kvenel the Tongue can be found sitting upon a throne. Should he be approached, he will attack, dual wielding the true versions of Eduj and Okin as he presses the assault. If Kvenel's spirit is put to rest again, the two weapons can be recovered from his remains. Silenced Tongues: Unlock the burial chamber of the Tongue Chieftain Kvenel.